The Year 4 class spent today on their final Titanic science investigations. They decided to try to find the best way to disperse the load on board the Titanic. Why a lemon apple and orange float and how would you make them sink? They created their own weight bearing pontoon, and investigated why not all metal objects sink. They followed this by taking afternoon tea on board The Titanic before the fateful news that they had hit an iceberg! This afternoon the children held a tea party to say goodbye and good luck to Mr Perry. First they mixed with other year groups on the field where they shared stories and kept cool in the shade. Next, they joined visitors for a tea party and enjoyed cool drinks and ice pops provided by the PTA. The Year 6 School Councillors and representatives from other classes said their thanks and talked about how Mr Perry would be remembered. Mr Smith (Chair of Governors) also expressed thanks on behalf of the board and whole community. Finally, the choir sang a beautiful version of A Million Dreams from The Greatest Showman to finish off the afternoon. It was a lovely afternoon to say thank you to a fabulous head teacher. The Reception children performed the story of Stella the Starfish for their end of term show. The children performance in front of a packed audience of parents, grandparents and friends was simply amazing. Their singing, dancing and acting was incredible. Mrs Gallimore wants all the children to know that she was very proud of you all! The West End has arrived in Alderley Edge! If you don’t believe us just take a look at these photos of our amazing cast of Mary Poppins. KS2 children will amaze and delight you with their renditions of the popular songs such as Chim chiminee, Spoonful of sugar… to name just a couple. Brilliant performances are given by Year Groups 3 to 6 in this timeless story of the nanny who arrives and adds a bit of magic to the Banks’ family. The first performance is on Tuesday evening at 6.30pm at Alderley Edge School for Girls and the final night is Wednesday 25th. Not to be outdone by their Key Stage counterparts, Key Stage 1 are presenting Eddie the Penguin Saves the World, on Wednesday and Thursday mornings in the school hall. KS1 Performances start at 10.00am. Eddie is on a mission to stop the polar ice caps melting and campaigns to show people how to save the world by growing trees and recycling rubbish. And, not to forget our youngest performers, they too are treading the boards on Wednesday and Thursday, before Key Stage 1. Our Reception class are presenting Stella the Starfish, a delightful seaside story. The Reception Show starts at 9.30am. All timings are approximate but the show will go on!! Year 3 get what they deserve!! A reward for outstanding efforts in class!! Year 3 'Wheelie' good fun afternoon! Year 3 achieved their class award and spent a lovely afternoon using 'wheels' in the playground and with other fun activities too. The Reception children had a wonderful time on their guided tour of the farm. They smelt the various aromas in the herb garden before visiting the hens. They even spotted The Little Red Hen! After lunch, they went on a tractor ride, around the farm, and learnt about what fruit and vegetables grow there. Afterwards, the children played 'hunt the strawberries'! Unfortunately, they were few and far between but they were lucky enough to pick blackcurrants instead. The children were amazingly well behaved and coped extremely well with the heat! Using the whole school theme of the World Cup, Year 6 have learning all about the Japanese art form called Manga. The children investigated the stylised animated characters and drew some of their own. Year 6 completed their project on volcanoes by exploding some of their own. They used bicarbonate of soda and vinegar to simulate an eruption and to see who could create the largest amount of lava. It was great fun. The environmental club have been busy helping to water our thirsty vegetable patch and plants around the school grounds. They were very excited to see how well our vegetables were growing! They then took cover from the sun and made lovely bookmarks using flowers they had pressed over the last few weeks. The results were brilliant so well done all! Year 3 have had a marvellous time learning 'How to Survive in Tudor England'. The children had a chance to make a Tudor rose and write using a quill and ink. There were toys and games from the time, and they brushed up on our Roman Numerals too. A wonderful interactive way to inspire their learning about history. Did you know that some children in our Life Skills group were afraid of dogs! Last week we invited the Dogs Trust to come and teach them how to use the x factor if they were scared! That means crossing your hands over your body so you won't get hurt. They were also taught how to handle dogs carefully, not like you would handle your teddy at home! If you see a dog and you would like to pet it, you must ask the owner first! Mr Perry brought his own dog (Leo) into school today so the children could practice what they had learnt! The children and Leo had fun!! What a busy but fun day. Following the Beeston induction and a quick bite to eat the children headed off to do some bushcraft/jungle camp survival skills in the woodland. This was hot and dusty work. The children are looking forward to teatime at 5.00pm before doing some orienteering and enjoying a camp fire before they settle down to bed for a good night's sleep!! The children are all well and have been brilliantly behaved. Year 2 had a super day at Millbank riding stables yesterday. They spent the day grooming the horses and learning the basics of how to ride a horse. They can now tell a horse how to start and stop as well as turn left or right and they can even trot! Day 5 of Sports Week - What a week!! To end a fabulous Sports Week, the Reception children ran 5 laps of the red line in just under 8 minutes. A super effort by all. Well done to Jack Hobbs for keeping us all running at a steady pace! Today Year 1 went into the Environmental area and worked really well with their partner, guiding them around. One of the children wore a blindfold and the other one gave them instructions, guiding them around a set course. Lots of clear instructions were given and great support was shown. Year 1 had a great afternoon at Alderley Edge Cricket Club playing Tennis. Lots of new skills learned and much fun was had. They are all set for Wimbledon now! Y3 loved the tennis at Heyes Lane and especially learning a new way to keep fit through Boxercise! Messing about on the river... well a lake actually..... and there was no stopping the Year 4s. Off they went to Tatton Park and spent the day, Pedal Karting, and flew high on the Zip Wire! Unfortunately it was too breezy for the bell boats so they had to paddle their way around the lake on their rafts. Another brilliant day! With the last bit of energy they had the Year 4s spent their final sports day learning new hockey skills at Alderley Edge Hockey Club, playing team games but above all showing what a fantastic class they are. Lots of focus, team playing, encouragement and sportsmanship. Phew...what a week! So, the last day of sports week! It certainly went full pelt, just as the rest of the week has, with cycling, boxing and the nightline. Take a look and see the sports we enjoyed today. Year 6 had a fantastic afternoon on Thursday at Wilmslow High School. The children joined other Wilmslow schools in a football and hockey festival led by staff and Year 9 students. The children participated in mixed school teams in skills practise followed by a mini-World Cup. Great fun was had by all. What an amazing activity, fun in the snow! Year 5 had a great opportunity to try out different snow sports, sledging, doughnutting and ice sliding! You can see from their faces that they really enjoyed falling off! Maybe this has sparked an interest in a different sport which they may never have tried before! Day 3 and Year 4 spent the afternoon honing their tennis skills at Heyes Lane Tennis club. Wimbledon Champions of the future...watch this space! The Reception children had a great morning developing their tennis skills with Mrs Hobbs. They learnt the importance of 'control' when playing the sport. We have some super tennis stars in the making! Thank you Mrs Hobbs - we had great fun! In the afternoon, the Reception Children had great fun working cooperatively during parachute games. They particularly enjoyed creating a 'mushroom' and playing 'cat and mouse'! What an exciting day orienteering around school. Year 3 had to use maps to find the clues to the world cup countries and then locate them back in class! They had to work in teams and support each other! Great fun was had by all and no one got lost!!! An amazing morning playing hockey with other Macclesfield based schools! Year 3 really were on top form as they learnt hockey skills and then played mini matches against each other. There were great passes and team spirit shown by all and everyone commentated on the progress made. Well done! Key Stage 1 had great fun learning a dance routine from Annie the musical. The children were singing, dancing and acting today!!!! Watch out Broadway!! Super lessons enjoyed by both the staff and all of the children. Aesha from Total Fitness ran the session and she holds classes there on a Friday if your child is interested!!! Year 2 had a wonderful afternoon at Alderley Edge Tennis Club yesterday. Although it was a bit windy, this did not stop our rising tennis stars from learning how to hit a forehand and backhand as well as keeping the ball in court! Great effort and lots of team work and laughter. 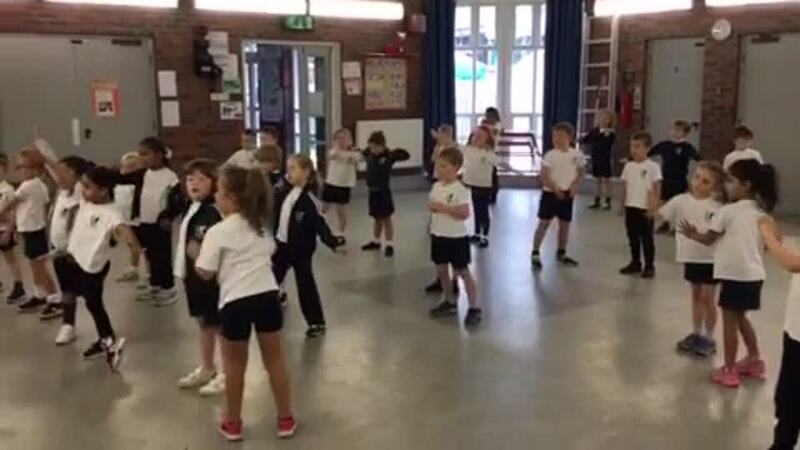 The Reception Children performed a theatrical dance to 'It's The Hard Knock Life' from Annie. All children performed so incredibly well. Aesha from Total Fitness was very impressed! Orchestra play with ‘Strictly’ Halle! Orchestra had a fantastic experience today, playing with the Halle at the Bridgewater Hall in Manchester. Along with thousands of other children, they played, sang and danced, while the Halle performed an exceptional show. The theme this year was ‘Strictly Halle’ so they were treated to Tchaikovsky’s ballet, modern samba and even Slavonik dance music; a thrilling opportunity to see professional musicians at work – and even Miss Rose dancing! Well done to all the musicians for the hard work leading up to the performance. Maybe some budding Halle members of the future? Day two of Sports Week found Year 4 having to use their initiative in a number of team activities to help them solve some tricky problems! The children from Alderley Edge Community Primary School have made their very own scarecrow for the Wilmslow Scarecrow Festival. The theme this year is characters from film and TV and one of the children, when asked, immediately suggested Operation Ouch! So that’s what they made!! Mr Perry (Headteacher) said many children have worked with two parents (Heather and Keri) to create Dr Chris. They have busy constructing and stuffing him for the last couple of days. Dr Chris is kitted out with all the right equipment thanks to one of our parents (a local GP) who kindly donated the props. Year 4 and 5 took part in a rugby festival hosted by Wilmslow High School. Lots of enjoyable games were played, enhancing existing rugby skills. The children, as always, played their best and thoroughly engaged with the activities. The Reception children began Sports Week with Boxercise with Mrs Park. They learnt how to use 'gentle hands' to perform a one-two straight punch to pads, a left and a right hook and an uppercut punch. They listened carefully to the instructions given and thoroughly enjoyed the session. Seb brought in his boxing gloves from home and practised his technique further with Mrs Park. Thank you Mrs Park- we had great fun! In the afternoon, the Reception children had a taster of Project X, delivered by PFC. This involved a series of activities to develop throwing and kicking skills. The children particularly enjoyed the Speed radar which measured the speed at which a ball was kicked or thrown. The children will have more time to develop these skills on Thursday as they are lucky enough to have Project X visit again! Year 6 started sport week with an exciting (but challenging!) opportunity to try their skills at BMXing. The children were kitted out in the correct safety gear and had to learn adapt their skills of bike riding to tackle a BMX bike where they had to stand up for the whole duration of the cycling. They then had to master the ramps and eventually had a ride on the national / Olympic track in the Velodrome. The children persevered (despite a few crashes and near misses) and all the children managed to make great progress. A fantastic time was had and year 6 would like to than our sponsors for this opportunity. Year 3 spent a fab morning learning tag rugby skills and then playing mini games at Wilmslow High School, supported by the school's sports ambassadors. Watch out England rugby squad we have a few potential members! All the children enjoyed the games and showed great progression of skills. Year4~5 got off to a flying start on Day 1 of our Sports Week. They spent the afternoon, alongside other schools from the Wilmslow district, taking part in the WHS Rugby Festival. They put into practice the skills they've been learning all year at school. What an amazing day our two Year 5 boys had at Lacey Green. The Artisan Day was designed to allow children to explore creating objects from the natural environment. Ben and James made 2 brilliant game boards from slices of tree trunks, counters from stones and bath salts with different fragrances. The 2018 PTA BALES RACE took place today - Friday 15th June. It started at 1.30 pm and the children tackled the bales course set out on the school field to earn sponsorship money from family, friends and indeed anyone else they can persuade to sponsor them. In the true spirit of sport, this year's race was designed to encourage teamwork, and maximise the fun. Our soon to be leaving Year 6 children, who have run this race for the last seven years, relayed with the Reception children, for whom this years race will be their first. They ran the first 5 laps together with Year 6 completing a final 5 laps on their own - all against the clock. After this the Year 5 children ran with Year 1 class followed by Year 4 with Year 2. Year 3 worked together in pairs, to relay their way around the course, completing 14 laps in total (7 laps per child). This is an event that the children look forward to every year and this year was no different. The photos speak for themselves. This is, of course, an excellent way for the PTA to raise funds for the school. We know from experience that a cheering crowd is a huge help in encouraging the children to finish so a big thank you to everyone who came along to offer your support to the children for this fun event. All children received a certificate for their achievement, recording the number of laps completed and their personal completion time. All children took home a sponsorship form recently and once again we are asking that any sponsorship money can be either brought into school in cash or paid by cheque after the event as usual. If you have not got any sponsors - don't worry - just donate through this link. In previous years, children have raised over £1500 for the school through this event. Our aim is to use this money to improve, still further, the sporting opportunities available to our children. We would be grateful if you would ensure that all sponsorship money is sent into school by Friday 22nd July. The Year 4 spent a day immersed in art when they visited Manchester Art Gallery. They were able to look at work from artists and architecture influenced by the Greeks. They also analysed the different styles of paintings of two seascapes to support their topic work on The Titanic. Finally, they created their own writing using the painting 'Work' by Ford Maddox Brown a pre-raphaelite artist; many of these artists created beautiful paintings of The Lady of Shalott a poem the Year 4s have studied in great depth. The environmental club was back in action this week searching for scary bugs, restocking their bug hotels to reach a 5* standard and watering their seeds which are just beginning to show! Their vegetable patch is looking very healthy so they then went on to see who could make the longest daisy chain!!! Many thanks to all the parents who came and helped and shared fab ideas! !